Identification: This species is distinctive in being dorso-ventrally flattened with broad parapodia that meet in the center of the notum and rhinophores that extend laterally. 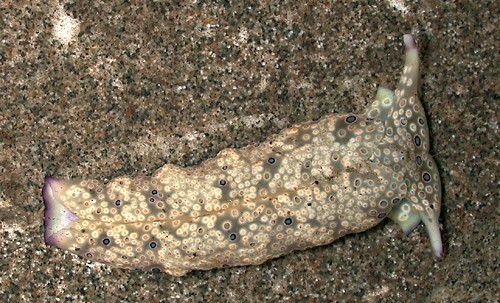 Its translucent, gray-cream body is decorated with yellow-centered and blue-centered ocelli and there are purple highlights on the rhinophore tips and posterior margin. Beneath the parapodia are longitudinal green ridges. Taxonomic notes: This species was named for the blue and yellow centered ocelli that cover the body and it's referred to as the "ringed sap-sucking slug" in Hoover, 1998 & 2006. It was first reported from Hawaii in Gould, 1852 (as Placobranchus ianthobapsus) and is listed under that name in Ostergaard, 1955. Elysia ocellata Pease, 1860 and Placobranchus argus Bergh, 1872 are also synonyms. It's listed as Placobranchus sp. in Edmondson, 1946 and Ostergaard, 1950. Photo: CP: Airport Beach, Maui; June 21, 2005. Note 1: Conceivably, the translucent tissue of the parapodia may be filtering or focusing sunlight in such a way as to optimize its spectrum or intensity for the retained chloroplasts (perhaps, in conjunction with the sand layer retained on the body surface? ).